different from other manufactured housing communities? 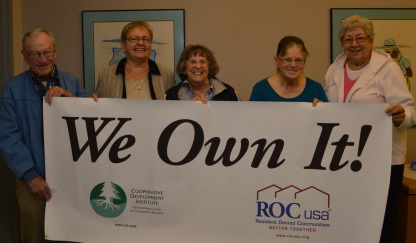 A ROC is owned by the community members who live there. In a ROC, the members elect a board of directors, which appoints committees to do different tasks and manage the day-to-day operations of the organization. Cooperative Development Institute provides the board with a management guide and teaches board members effective ways to run the community. This includes, but is not limited to, how to set up a financial record-keeping system and how to use resources to improve the roads, water, electric and waste-water systems. Also, in a commercially owned community, the theory is that if you don’t like how the park is being managed, you can move your home. But “mobile” homes these days are not very mobile. Many homes could not withstand the move. Affordable lots are hard to find. If you live in a park without protection from skyrocketing rent or even park closure, you could be at risk to lose your home. In a resident-owned community (ROC), if you don't like how the park is being managed, you can run for a position on the board of directors and make improvements inside the organization.